A demonstrator shouts slogans during a protest at Paulista Avenue in São Paulo, Brazil in June 2013, part of a wave of protests over corruption and the economy that have shaken the nation in recent years. Photo by Nelson Antoine/Associated Press. Last August, Brazil’s leftist President Dilma Rousseff was forced to step down from office after the nation’s senate voted to impeach her. But Rousseff’s true downfall came months earlier, when record numbers of Brazilians turned out in street protests to demand her resignation. Brazilians often are characterized as politically passive, tolerant to a fault, and overly indulgent of their leaders’ many failings. In this context, gargantuan street protests have been seen as occasions when the sleeping giant of the Brazilian public is stirred to action. I’m a native Brazilian who has lived in the United States for long periods, and I now split my time between Rio de Janeiro and New York. In a society like the U.S., there are so many democratic instruments through which to participate, and so many ways to celebrate your political identity. But as a Brazilian you don’t have that many options. The major parties are all but obsolete, and the minor parties are disgusted with traditional politics; as a result, no party engages in policy. So to express yourself politically, the street demonstration is one of your few openings. It’s no wonder, then, that Brazilian governments of wildly different types—from autocratic military regimes to democratically elected presidents—have taken their cues from the street in determining whether they had the legitimacy necessary to hold onto power, or could cling to it by their fingernails. At several crucial points in post-World War II Brazilian history, mass street protests have catalyzed public sentiment and propped up or brought down governments. One such time was in March 1964, when a military coup d’etat toppled leftist President João Goulart, ushering in a right-wing military dictatorship. A show of support for the dictatorship in the streets legitimized the overthrow. It was organized by conservative Brazilian forces who feared, in the heated atmosphere of the Cold War, that South America’s largest country might go down the revolutionary socialist path of Fidel Castro’s Cuba. But just four years later, as the military regime turned more repressive—through growing censorship of the media, outlawing of opposition parties, and even the compulsory expulsion of targeted professors from universities—the streets turned the other way, with protestors taking on the military rulers. The outpouring came in alliance with protests in France, where students turned out en masse in 1968 to decry established power, and in the United States, where campuses erupted in protest against the Indochina War. 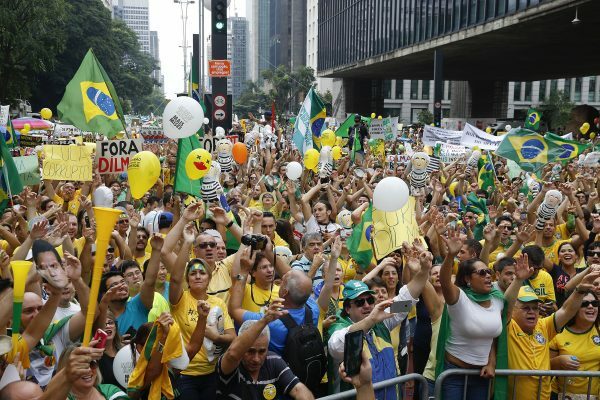 Demonstrators gather in São Paulo to demand the impeachment of Brazil’s then-President Dilma Rousseff in March 2016. Rousseff was eventually toppled over alleged fiscal mismanagement. Photo by Andre Penner/Associated Press. The dictatorship survived, however, by cracking down on protest backers (removing many people from the streets to the prisons). The regime also was boosted by the perception (fair or not) that the military regime deserved credit for the so-called “Brazilian miracle” of economic expansion between 1968 and 1973, when the nation’s economy grew at an average annual rate of 11 percent. But then Brazil’s economic engine sputtered under the burden of its soaring sovereign debt payments. By the early ‘80s, Brazilians were blaming the military government for their shrinking purchasing power, and in 1984 hundreds of thousands of Brazilians in São Paulo and other major cities went on the march demanding the return of free elections. Realizing it no longer could hold back the popular tide, Brazil’s military regime relinquished power in 1985, and democracy was restored. One galvanizing leader of the ‘80s protest movements was the Brazilian soccer idol Sócrates Brasileiro Sampaio de Souza Vieira de Oliveira (AKA Sócrates), whose São Paulo club team, Corinthians, joined in the calls for new elections. The team’s advocacy efforts, along with its egalitarian organizational style, became known as “Corinthian Democracy,” a sporting microcosm of how Brazil itself could become a more open society. The team also served as an example of how socially active celebrities and pop culture figures can upstage political leaders and serve as a loudspeaker for popular movements. Democracy didn’t end the mass demonstrations. Indeed, people in the streets would eventually bring a conclusion to the presidency of Fernando Collor de Mello, who took office to high expectations as a self-styled crusader against corruption and privilege. He lasted only two-and-a-half years before being driven from office in 1992 amid corruption allegations. While mass street protests often were decisive in legitimizing or delegitimizing Brazil’s ruling powers, in some cases the protests had the exact opposite effect desired by the demonstrators. The anti-military outcry of 1968 provoked a harsh response by the generals; by many measures, 1969 was the darkest year of the two-decade dictatorship, as jail cells filled with dissidents and government opponents “disappeared,” and prominent artists, activists, and intellectuals fled into European or U.S. exile. Perhaps the most ironic example of these unforeseen effects was when the besieged President Collor called for Brazilians to show their support for him by turning out on the streets wearing green and yellow, the national colors. Instead, tens of thousands showed up the next day decked in black—and Collor was soon gone. The fact that street protests can knock governments out of power in a manner of weeks, or even days, speaks to Brazil’s shaky democratic traditions. In the past half-century, only two of the country’s democratically elected presidents, Fernando Henrique Cardoso and Luiz Inácio Lula da Silva, have managed to serve out their full terms in office. It’s noteworthy that no mass protests arose during President Lula’s eight-year rule, even though his administration was marred by a massive vote-buying scandal. Why did most Brazilians stay off the streets? Likely because the economy was booming, fed by China’s insatiable demand for soy, iron ore, and other commodities. The fact that street protests can knock governments out of power in a manner of weeks, or even days, speaks to Brazil’s shaky democratic traditions. In the past half-century, only two of the country’s democratically elected presidents … have managed to serve out their full terms in office. But the economy began to sour after da Silva was succeeded by his protégé, Rousseff, sparking a new round of mass demonstrations from April to July 2013. Their suddenness and intensity caught politicians by surprise and shocked the watching world. Though the nominal cause was a transit fare hike, the protesters’ true target was a state-capitalist system that over-taxed Brazilians felt had short-changed them by delivering second-rate services and inefficient government. The police cracked down violently. Black blocs and anarchists smashed ATMs and auto dealerships’ windows, overturned cars, and set buses ablaze. 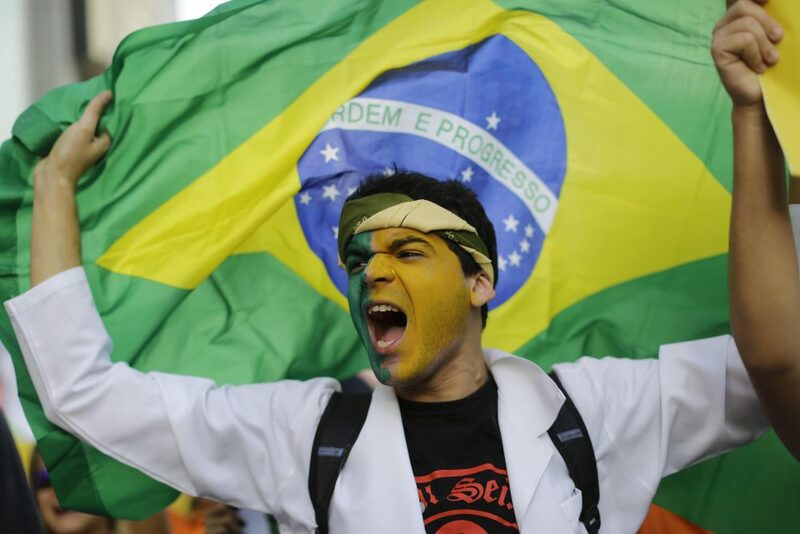 The anger unleashed in 2013 continued to simmer as Brazil sank into what would become its worst recession since the 1930s, and an epic political scandal, dubbed “Operation Car Wash,” unfolded around the giant state-run Petrobras oil company. Rousseff’s government and her tainted Workers’ Party were showing signs of fatigue and had lost the moral high ground, and her congressional coalition was dangerously eroded. The pressure cooker finally exploded in the first months of 2015. Grassroots groups like Vem Pra Rua (Come To the Streets) tapped a non-partisan mood of popular disenchantment. Some protesters took to wearing rubber masks depicting Sergio Moro, the hard-charging federal judge heading the Petrobras case. Social media brought demonstrators together without any need for formal political leadership, giving citizens a new sense of their own autonomous power. Although she defiantly resisted the verdict of the streets for many months, Rousseff accepted the impeachment vote, and power was peacefully transferred to her successor and former vice-presidential ally turned enemy, President Michel Temer. And Temer? Less than a year after effectively taking power, he has faced scattered demonstrations challenging his legitimacy and calling for his removal. But Temer has summoned an experienced and competent group of bankers and policy makers who form the core of his teams at the Finance Ministry, the Central Bank, and some state-owned enterprises. As a consequence, Brazil’s macroeconomic numbers are no longer deteriorating. Inflation levels are falling. Petrobras, the Brazilian Development Bank (BNDES) and the electric company Eletrobras are well-managed. Some structural adjustments in limiting public expenditures to fiscally-responsible levels, reforming social security, and modernizing labor legislation are going forward. Brazil’s GDP will resume expansion in 2017. Now, if Temer remains unharmed by corruption investigations, not only will he have helped jump-start the economy and moved forward on institutional reforms, but he will hand his successor a much more stable country on January 1, 2019. Given Brazil’s recent tumultuous trajectory of dysfunctional politics and economic mismanagement, this will be no small accomplishment. But in order to support his ruling coalition, Temer must deal with a political class that is largely vulnerable to the ongoing investigations of the “Car Wash.” If senior members of his administration end up being engulfed in the scandal, Brazil will face a long, rocky road to October 2018 presidential elections—and, no doubt, more and bigger crowds taking to the streets. Marcos Troyjo is a Brazilian political economist, entrepreneur, social scientist, writer, and diplomat, and is director of the BRICLab at Columbia University. This essay is part of an Inquiry, produced by the Berggruen Institute and Zócalo Public Square, on what makes a government legitimate. Primary Editor: Reed Johnson. Secondary Editor: Joe Mathews.